Woodrow Wilson “Woody” Guthrie (1912-67) was one of the most important folk composers in American history. "This Land Is Your Land" is ubiquitous in American life and regarded by many as an alternative national anthem. His songs have influenced generations of musicians and the work of the Center. Born in Oklahoma, Woody is generally associated with the common people and those displaced by the great dust storms of the 1930s. He is the source of the image of the folk singer with a guitar slung over his back. Although Woody was amazingly prolific, of the thousands of songs he wrote only relatively few were actually recorded; most exist only as lyrics on a page. Woody was known to pick up the newspaper in the morning and have a few topical songs written by lunch. He was a passionate, talented writer; his autobiographical novel Bound for Glory inspired other literature and films. Woody was also an artist, producing thousands of pen and ink drawings, many now in the Center's Ralph Rinzler Folklife Archives and Collections. Woody's earliest recordings, Dust Bowl Ballads, for RCA were reissued by Folkways Records. Alan Lomax's Library of Congress recordings of Woody were later commercially released by Elektra and then again by Rounder Records. Woody's association with Moses Asch of Folkways Records generated most of his recordings. Asch gave Woody a stipend to drop by the studio when he felt like making a recording. A single one-day session in March 1944 yielded 75 songs. These Asch recorded, like the others, on glass discs now in the Moses and Frances Asch Folkways Collection in the Rinzler Archives. Asch released much of this material—folk ballads, protest songs, and songs for children—on Asch, Disc, and Folkways albums. Woody recorded with many of the best folk singers in New York. A one-time member of the Almanac Singers with Pete Seeger, Lee Hays, Bess Lomax Hawes, and others, Woody also frequently performed with Lead Belly, Burl Ives, Cisco Houston, and Sonny Terry and Brownie McGhee. Woody was never a concert artist and generally performed at union rallies and for small groups. He sang on radio and wrote a newspaper column. His music and politics were solidly intertwined; music was a weapon to effect social change. Woody's guitar was famously inscribed: "This Machine Kills Fascists." His songs supported the rights of workers and those on the margins of society; they attacked unfairness in the American economic system and injustice to immigrants. Though initially against World War II, Woody served as a merchant marine and sang in support of the war effort. Woody played in New York's Washington Square Park in the late 1950s, influencing young musicians like Ralph Rinzler, and helping spark the Folk Revival. One of those young musicians, Bob Dylan, said, "When I first started out I was nothing but a Woody Guthrie jukebox." Jack Elliott, Bruce Springsteen, Bono, Ani Di Franco, and Billy Bragg all point to Woody's influence. Woody passed away in 1967, but he has had a vital influence on the Center. A 1982 Festival concert by Seeger, Arlo Guthrie, and Rinzler for the Oklahoma program featured Woody's music. To help pay for the acquisition of Folkways Records by the Smithsonian, Rinzler, Woody's manager Harold Levanthal, and Don Devito produced a Grammy Award-winning benefit album, Folkways, A Vision Shared: A Tribute to Woody Guthrie and Lead Belly. Dylan, Springsteen, U2, John Mellencamp, Willie Nelson, Emmylou Harris, Doc Watson, Arlo Guthrie, and Seeger rendered their versions of Woody's "Pretty Boy Floyd," "I Ain't Got No Home," "Vigilante Man," "Jesus Christ," "Do-Re-Mi," "Philadelphia Lawyer," "Hobo's Lullaby," "East Texas Red," and "This Land Is Your Land." 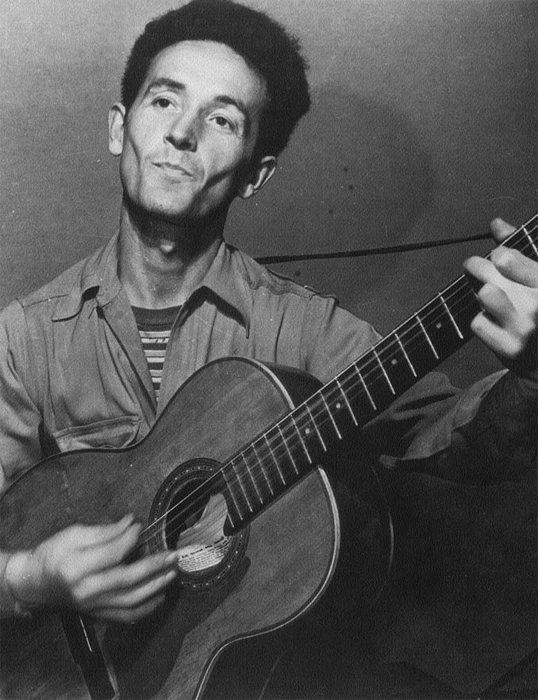 Smithsonian Folkways has reissued numerous Woody Guthrie recordings. 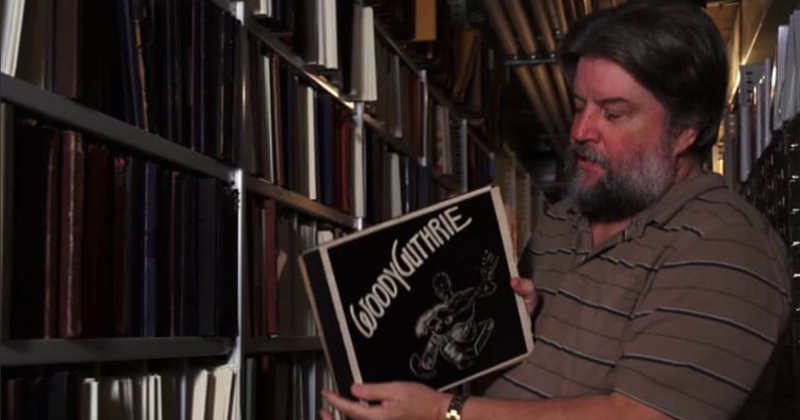 In 1990, Center archivist Jeff Place discovered the original recording of "This Land Is Your Land" on a glass acetate master. At the 1998 Festival, Woody was honored with a U.S. postage stamp, presented to his children Arlo, Jody, and Nora. An exhibition on Woody produced by the Smithsonian and the Guthrie Archives traveled across the United States and was mounted in the National Museum of American History. In honor of the Woody Guthrie’s 100th birthday on July 14, 2012, Smithsonian Folkways released an in-depth commemorative collection of songs, photos and essays on one of America’s most treasured 20th-century icons. Woody at 100: The Woody Guthrie Centennial Collection is a 150-page large-format book with 3 CDs containing 57 tracks, including Woody’s most important recordings such as the complete version of “This Land Is Your Land,” “Pretty Boy Floyd,” “I Ain’t Got No Home in This World Anymore,” and “Riding in My Car.” The set also contains 21 previously unreleased performances and six never-before-heard original songs, including Woody’s first known—and recently discovered—recordings from 1937. "This land is your land, this land is my land, from California to the New York islands, from the redwood forests to the Gulf stream waters, this land was made for you and me."